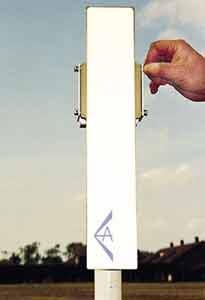 For FRA (Fixed Radio Access) applications European Antennas has designed two new lightweight, slim panel, sector antennas covering the frequency range 3.4 to 3.6GHz, one vertically polarised and one horizontally polarised. from -30 to +60 degrees Celsius. With the combination of low wind loading and compact size, they can use smaller mounting structures than most other antennas in this market. This has the benefit of lower base station rentals and may help satisfy the most stringent environmental and planning regulations. These antennas have 16dBi gain, 60 degree sector coverage and 10 degree elevation HPBW combined with a fixed electrical down-tilt of 2 degrees for optimal cellular coverage. Low azimuth side lobes allow efficient frequency re-use in high capacity areas and maximise operator revenues. They comply with ETSI specifications for co-polar and cross-polar radiation patterns.